No one likes to clean their rabbit's cage, but sticking to a schedule will make it less of a chore. There are no set rules for how often to clean your rabbit's cage, but by doing a small amount of cleaning every day you will make things easier on yourself. As a general rule, clean your rabbit's cage thoroughly at least once a week. However, your rabbit's cage might need deep cleaning more often, depending on the size of the cage and how well your rabbit is litter-trained. If you have more than one rabbit, it will need to be cleaned more often. Do a little bit of cleaning every day to keep your rabbit's cage looking and smelling fresh. Remove any uneaten fresh foods from the cage daily. Ideally, do this twice daily, once in the morning and again at night. Wash out the food bowl(s). Wash and refill the water bottle. A bottle brush will make this task easier. Spot-clean small messes such as water spills and urine clumps that are outside the litter box. Replace these areas with fresh hay or bedding if necessary. Scoop the litter box and add more litter or change out the litter as needed. Pick a day of the week that you go a little further into the cleaning process. Remove all accessories and toys from the cage. Wash and scrub them using water and dish soap. Remove and wash all fabric bedding from the cage. Replace with clean bedding. Wipe down the cage with hot water and use vinegar to help remove stubborn urine deposits. If you have a smaller cage, you may want to take it apart and rinse it with water in the bathtub or with a hose outside. Disinfect your cage, but any disinfectant needs to be rinsed really well. Disinfectant cleaners are not good options for wood cages because it soaks up the chemicals if the wood isn't properly sealed. A bleach solution of part bleach to 10 parts water can be used to disinfect the cage and other supplies. Allow the cage and other items to soak in this solution for about 30 minutes and then rinse everything extremely well. As mentioned, litter boxes should be checked and spot-cleaned daily. This is not only helpful for cleanliness, but it is also important as a way to monitor your rabbit's urine and feces output. Any changes could indicate a health problem with your rabbit. The frequency of complete litter box changes and cleaning will depend a lot on the type and amount of litter you use. If you use a shallow layer of litter, you might want to clean out the litter box daily. If you use more litter to make a deeper layer, simply scoop out messes and completely change the litter less frequently. Calcium salts tend to precipitate out of rabbit urine and form a hard material that sticks to cages and litter boxes. Vinegar dissolves these calcium salts, so keep it in a spray bottle for quick cleaning of litter pans and to spray down soiled parts of the cage. If your litter box has more stubborn deposits, simply soak them with vinegar for 10 to 20 minutes. Choose absorbent bedding to make cage cleaning easier. Invest in two sets of bedding/blankets for each rabbit cage to make this easy for yourself. Look for a large cage that is easy to clean. Exposed wood surfaces soak up urine and other messes and are difficult to clean. 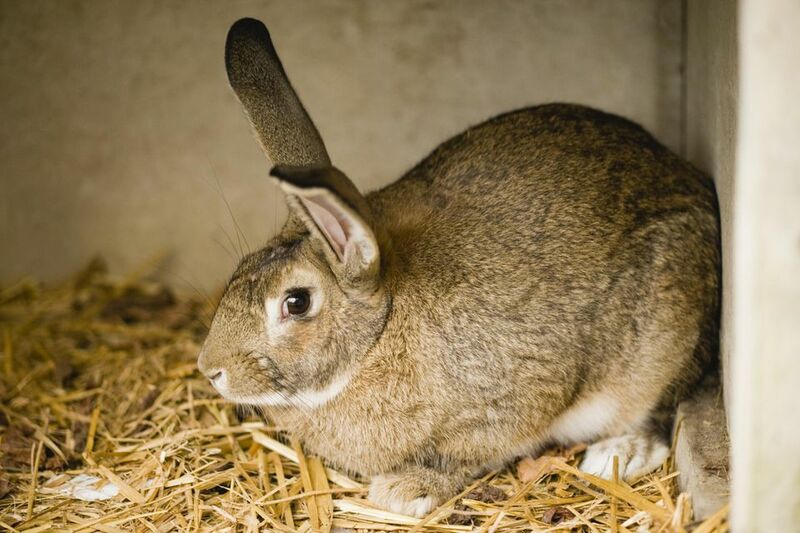 Spaying or neutering your rabbit keeps the cage cleaner by reducing the incidence of territorial marking and spraying.